Byron Loker’s short story “Your Stop” was collected in this anthology edited by Karina Magdalena Szczurek. 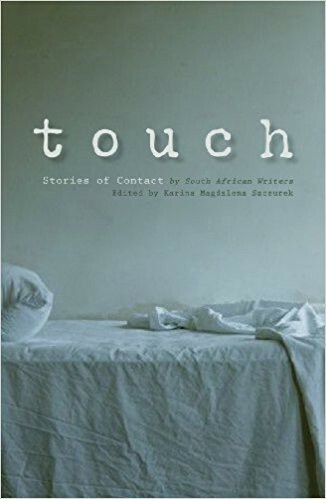 For this unique and impressive anthology, some of South Africa ‘s top storytellers were invited to interpret the theme of touch. The result is a scintillating collection of twenty-two stories about all kinds of human interaction. There are tales of love lost, and of newfound intimacy. Some describe encounters with strangers, others explore family relationships. Most deal with touch in a physical and emotional sense; one or two consider the idea of keeping in touch. Between them the authors have won two Caine Prizes, one PEN Award, three Alan Paton Awards, two Sunday Times Fiction Prizes, two M-Net Literary Awards, several CNA Awards, a Commonwealth Writer ‘s Prize (Africa Region), one Booker Prize, and the Nobel Prize in Literature.Touch: Stories of Contact brings us work from such established luminaries as Andr Brink, Nadine Gordimer, Damon Galgut and Ivan Vladislavic, as well as exciting new voices such as Alistair Morgan and Julia Smuts Louw. Whether poignant or light-hearted, fictional or autobiographical, these innovative stories remind us of the preciousness of touch and are a testimony to the creative talents of South Africa ‘s writers. All the authors have agreed to donate their royalties to the Treatment Action Campaign (TAC).